You'll be £10.50 closer to your next £10.00 credit when you purchase Wargame Scenarios: The Peninsular War 1808-1814. What's this? Order within the next 8 hours, 10 minutes to get your order processed the next working day! The enjoyment of wargaming is greatly enhanced if the battles (games) are played within well thought-out scenarios. Instead of simply lining up evenly-matched armies and fighting to the death, the players can have realistic objectives (such as the capture of a vital piece of terrain or delaying a superior enemy to cover a retreat) and be confronted with more challenging tactical decisions. Devising such scenarios can take a lot of effort, and more critically, time, which is always in short supply. 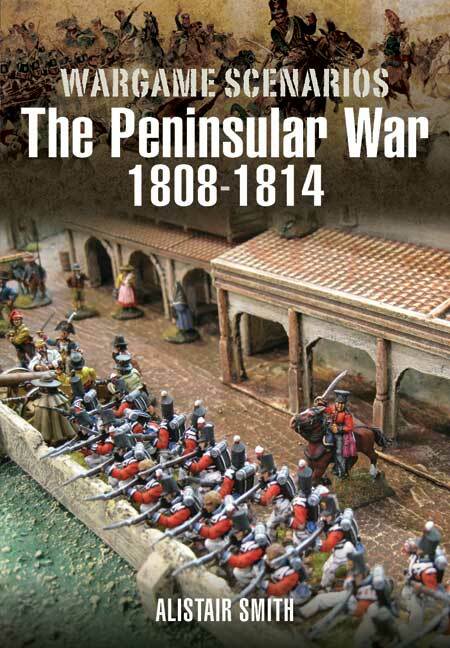 This book is designed to take the time and effort out of organising fascinating and challenging wargames set in the Peninsular War. In addition to 20 carefully devised scenarios of varying size and complexity, this book contains a concise introduction to the theatre of operations and an integrated chronology of battles and campaigns, showing where the scenarios fit into the wider events. The scenarios and orders of battle are intended for use with Pen & Sword's own Napolenic wargame rules, Grand Battery, but they are easily adaptable for use with other leading systems. • Briefing notes on the context of the battle and the dilemmas and objectives facing each commander. Orders of battle for each side and any other information required to set up. • Concise introduction to the Peninsular War with chronology to place the scenarios in context. • 20 carefully devised scenarios of varying size and complexity. • a wargamer-friendly map, showing players where to place terrain, buildings and other features that had an impact on the battlefield. It will also show initial dispositions (historical) and mark the point of entrance (or exit) of units during the battle. Ideal for the wargame "Grand Battery" complement. Read the full Spanish review here. This book has been designed in an attempt to take the time of effort out of organising war games set in the Peninsular War in Spain and Portugal 1808-1814. There is an introduction to the theatre of operations and a narrative of the various campaigns, placing the scenarios into their historical context. The scenarios and orders of battle are primarily intended for use with Pen & Sword’s Grand Battery Napoleonic war game rules, but are probably adaptable for use with other rule sets. There are 20 scenarios on offer here, varying in size and complexity, but each based on historical engagements involving British, French, Portuguese and Spanish forces. Each scenario is accompanied by a very small size map, which in fact is of limited use to the war gamer. The maps are the only illustrations in the book. Alternative orders of battle are provided, allowing for the scenario to be played ‘in the grand manner’ or as a scaled down version for a quicker game. Campaign rules and a system for generating one’s own hypothetical scenarios are also included. This 222-page paperback is designed to help expedite organising compelling and challenging wargames. A concise introduction to the campaign and a chronology of events complement 20 thoughtfully devised scenarios of varying scope and complexity based on key engagements involving British, French, Portuguese and Spanish forces. enthusiasts will find this book a very valuable assistant, but it is also useful to a wider readership, particularly to those who are considering adopting wargaming as an absorbing hobby. The book's structure is very logical and easy to follow. The clear text is supported effectively by many illustrations, including charts, tables, sketches, maps and battle guides. Alister Smith has been a military researcher for many years, His main areas of interest are twentieth century warfare, weapon systems, vehicles and aircraft.